But maybe not just yet. The New York Post reported today that, according to sources, a JPMorgan-led group, which holds a $1 billion revolving line of credit, is granting Samson a waiver for an expected covenant breach. This would avert default for the moment. Under the deal, the group will reduce the size of the revolver. Last year, the same JPMorgan-led group had already reduced the credit line from $1.8 billion to $1 billion and had also waived a covenant breach. But it was the crash in the price of “liquids” that made investors finally squeamish, and they began to look beyond the hype. In doing so, they’re triggering the very bloodletting amongst each other that ever more new money had delayed for years. Only now, it’s a lot more expensive for them than it would have been three years ago. While the companies – or their assets – will get through it in restructured form, investors get crushed. I still say the Fed/Treasury will backstop this implosion in some form or fashion. You see JPM stepping in to “assist”. This is only the start. Since the US is complicit with Saudi Arabia in forcing oil prices down to hurt Russia and Iran, the US will “help” some of the main players in the fracking industry. Probably all. That would look too obvious. They will pick winners and losers just like 08/09. But they will not let the whole thing implode either. This is a Saudi play alone. 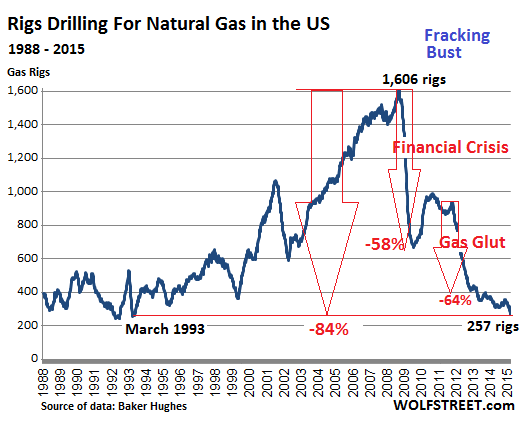 They want to drive the US frackers out of business and may succeed. I don’t know what the US Public patience limit for bailing out Wall Street scum is, but we may find that out as well. They (government) have already talked of buying 5 million barrels of oil to goose prices, but this would seem counterproductive if the drop in prices was a concerted effort to hurt Iran and Russia. I don’t think they planned it. This is just an inevitable occurrence from years of central bank credit infusion. Wall Street owns the government, and Wall Street is bleeding right now because of this, and more bleeding is to come. I think central banks around the world have backed themselves into a corner trying to placate the global sociopolitical elite and have no exit strategy for the coming crisis. On the other hand, the coming crisis could just be a setup to justify another windfall of bailouts and “stimulus” to the big players, effectively thinning the herd by eradicating the up and comers who aren’t politically insulated from ruin, and of course fleecing the common man of more of his hard earned buying power. I suppose the outcome depends on whether enough of us common men realize what is going on and who to blame when it all goes down again. the employees are more likely to be “crushed” than the investors……. The only thing that has kept the whole fracking/shale business on its (increasingly wobbly) feet in face of plunging prices is the desperate hunt for yields. That’s it. Take a look at corporate and sovereign bonds in investment grade (from AAA to BBB). Take a look if you dare. If you are lucky and it’s a good day you may find something yielding 2.1% after commissions and capital gain taxes. Bonds denominated in BRICS and mini-BRICS currencies (Brazilian real, South African rand, Turkish lira etc) may yield more… but is it a game you really want to play? The dollar stumbled yesterday, but it’s already climbing back. The Fed can (and most likely will) opt to stay out of the currency war. Ankara and Brasilia are already on the war path. 2.1% may sound reasonable, but we all know real world inflation will just chew all of that away and dent the capital as well. You need more yield just to stay in the same place. At that point you have only one option: close your eyes and start scooping up junk. Now, the interest this junk pays doesn’t reflect how broken the fundamentals are. Greek bonds today pay 12-16% according to maturity. Does that really reflect the risks? The same applies to fracking and shale outfits. Double digits yields may look good, especially after six years of ferocious financial repression, but do they really reflect the risks? These outfits weren’t making money with oil at over $80/barrel. They are loaded with debt that, by modern standards, is quite expensive to service. They need to keep pumping at full speed just to generate cash flow: they cannot adapt production to reduced demand to allow prices to normalize. And, probably worse than all, there isn’t a bailout in sight. Banks in Texas, North Dakota etc which depend on the oil industry will most likely get a bailout, but only if things for them get really ugly: they have not enough political clout to pull an Immelt. But the outfits themselves… they’ll drop dead by the wayside one after another as they are crushed by their own debt. If sanctions on Iran are lifted, expect the pace to quicken: the ayatollah are so desperate for hard cash they’ll pump every single barrel they can, and some, regardless of price. At this point I maintain my original take: there won’t be an oil bust like we saw in the ’80s. This will be like Napoleon’s Grand Armée withdrawing from Russia. People falling over from sheer exhaustion and groups of stragglers left behind to be cut up by Cossacks and eaten by wolves. The Cossacks and the wolves are vulture funds and giant oil companies such as Exxon-Mobil and Chevron. No need to tell why vulture funds have been smelling blood. And Big Oil will just be able to scoop up assets at rock bottom price using its unlimited credit. Why bother with Petrobras’ fire sale when you have a foreclosure auction in your own backyard? The government cannot bail out the oil business, it has been subsidizing it from the beginning … and yet it has failed! The man on the bottom goes bankrupt first, then the man in the middle, finally the tycoon cannot find either bottom men or middlemen to repay his debts; both he and his lender must fail. The government has no independent source of funds it must borrow against the accounts of the bottom men …and they are already ruined. The ruin of the bottom man is the reason why oil prices have collapsed. The petroleum markets are international: the bankrupt marginal customer is likely Japanese or Russian … tomorrow, Chinese. When the man on the bottom is ruined, there is nobody able to borrow … to retire the debts of the drillers. Of course, the bosses might set up a command economy as during WWII … but that would not work w/ the US as consumption would collapse even further. Anything else is more of what has obviously failed.